Just about the time you think you've seen it all along comes a movie that redefines everything. RESERVOIR DOGS, THE TEXAS CHAINSAW MASSACRE, NATURAL BORN KILLERS, THE LAST HOUSE ON THE LEFT, STRAW DOGS, PULP FICTION -- none of these films compare to the astonishingly disturbing FUNNY GAMES, the 1997 Austrian film written and directed by Michael Haneke. There are lots of descriptive words that leap to the forefront: harrowing, distressing, uncomfortable, chilling, compelling, unbearable and gut-wrenching are just a few. The acting is outstanding, especially Susanne Lothar as the mother of a family terrorized by two sadistic but-ever-so-polite young killers. And Haneke knows how to clinically ratchet up the inexorable tension while, at the same time, irritating the viewer beyond what I thought possible from a screening experience. Yes, I said irritating -- in the same vein as Ms. Fundis streaking chalk across the blackboard in seventh grade -- where every nerve ending imaginable is zapped to the fullest extent. 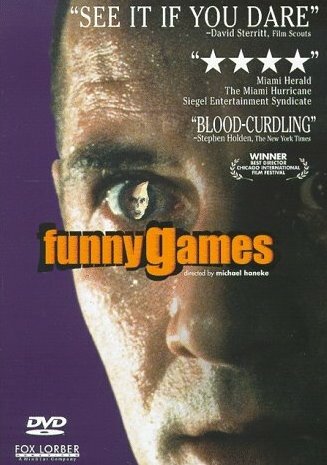 FUNNY GAMES is also infuriating because Haneke tries something incredibly stupid at the 90-minute mark. Some ersatz film critics have applauded the director for his decision to break the fourth wall -- as if this hasn't been done before. One example is MR. SARDONICUS from beloved schlockmeister William Castle. For Mr. Castle it was a gimmick that worked, at least to a degree. Unfortunately, the same can not be said for Mr. Haneke -- even Film 101 students at the University of Texas know better (although I'm not so certain that's true about the over-rated faculty). In closing, let me assure you that should you chose to see FUNNY GAMES you will hate it for what it does to you. But, I also can assure you that you will not be able to turn away.